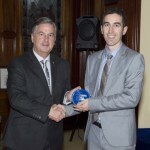 The Centre congratulates Dr Luke Selth on receiving the South Australia Tall Poppy Science award. The award recognises intellectual and scientific excellence of young Australian scientists. Dr Selth is a Post-Doctoral Scientist at the Adelaide Prostate Cancer Research Centre, Dame Roma Mitchell Cancer Research Laboratories, Discipline of Medicine, University of Adelaide. Dr Selth received his award from His Excellency Rear Admiral Kevin Scarce AC CSC RANR, Governor of SA, at Government House on 30 July 2013. Dr Selth was supported by a Freemasons Foundation Centre for Men’s Health Post-Doctoral Fellowship in 2010 and 2011. Luke then went on to receive a Young Investigator Fellowship from the Prostate Cancer Foundation of Australia and in 2012 received a young investigator grant from the American Prostate Cancer Foundation, an award rarely given to scientists outside of the USA. Over the coming 12 months, Dr Selth will participate in activities to promote study and careers in science among school students and teachers as well as an understanding and appreciation of science in the broader community. This entry was posted in News and tagged award, prostate, prostate cancer, research. Bookmark the permalink.